Idly is a universally accepted and sought after dish for its simplicity in terms of preparation, adaptability, digestion and taste. There are innumerable varieties already but you find a new variant coming up everyday. So much for its adaptability to any ingredient added to it. Wash & soak urad dal and rice separately at least for 4 to 6 hours. Grind them separately in a grinder to a thick batter. The rice can be ground a bit coarsely. Add salt as required and mix together. Let is ferment for 6 to 8 hours. Add ghee to a pan and fry the Cashew nuts till brown. Add to the batter. Pour oil in the pan and add mustard seeds. When it splutters add cumin, pepper and ginger and fry for a few seconds. Add to batter and mix well. 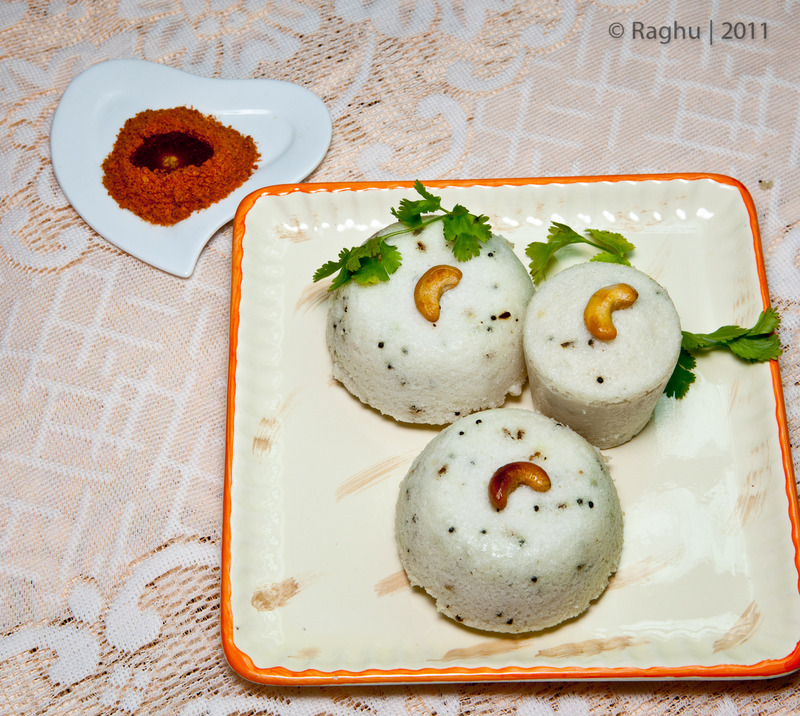 Pour the idly batter in idly plates after greasing them with oil and steam till it is done. Serve hot with appropriate chutneys or sambar. Tips: Thick Sour curds can also be added to the batter if it has not fermented well. However ensure the batter does not become watery. Instead of Idly plates this batter can also be poured in long tubular cylinder like vessels [puttu Koralle] or even in your normal tumblers after greasing them well. Alternatively they can also be poured in shallow plates with at least 2 inches depth and then steamed. This can be cut into squares and served.